Eric Albright is leading a normal life until a small red door appears under a train bridge near his home. Then a ghostly being wakes him in the dead of night, with a message from another world: You are Shadow. In Levaal, the world between worlds, the dragon-gods grow restless in their sky prisons, and the Great Spirits struggle to contain them. Vous, the worlds Friend and Lord, simmers in madness as he schemes to join the ranks of gods. He and the Arch Mage have almost won their final victory over the Free Cities. A dark age dawns. But Eric and his friend Case are now Pilgrims, called to Levaal for a battle more ancient than the petty squabbles of men. And they will learn why some doors should not be opened ... PRAISE FOR WILL ELLIOTT: Inventive, scary and darkly humorous (THE OBSERVER). 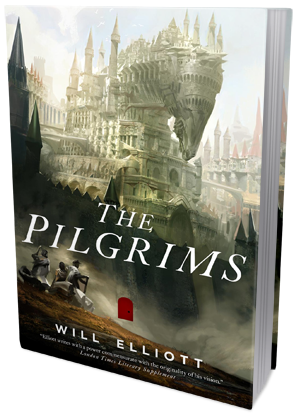 Thanks to the fabulous folks at TOR Books one lucky winner will get a gorgeous hardcover copy of THE PILGRIMS by Will Elliott!